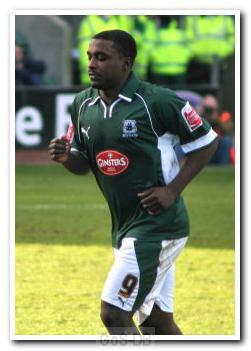 Ebanks-Blake moved to Argyle from Manchester United, whom he had helped win the FA Youth Cup. He suffered a broken leg in 2005 but made a swift recovery and joined United's feeder-club, Royal Antwerp of Belgium, in a short-term loan deal the following year. He was signed for Argyle in July 2006 by Ian Holloway, who beat off competition from several clubs to secure his services. A well-built, robust striker, his impressive goalscoring record in his first 18 months at Home Park led to interest from many clubs, and Wolverhampton Wanderers eventually invoked a clause in his contract that allowed him to leave if an offer of £1.5 million was received. Ebanks-Blake moved to Molineux in January 2008 and ended that campaign winning the Championship Golden Boot, scoring a total of 23 goals (12 for Wolves and 11 for Argyle). Named Championship Player of the Year at the 2009 Football League awards, he played a pivotal role in Wolves gaining promotion to the Premier League the following season and retained his Golden Boot award with a tally of 25 league goals. However, he struggled to repeat his goalscoring feats at Premier League level, scoring just 12 goals in 87 appearances over the following three top-flight seasons. He managed to recapture a semblance of goalscoring form when Wolves returned to the Championship in the 2012–13 season, but sadly he broke a leg for the second time towards the end of the campaign and was unable to prevent Wolves from plummeting into League One. That summer he was released and after recovering from his bad break, Ebanks-Blake signed for Ipswich Town in December 2013, joining forces once again with former boss Mick McCarthy. Injuries again severely disrupted his time on Suffolk and he failed to score for the Tractor Boys in ten appearances. He had trials with Brentford and at DPMM, managed by ex-Blackburn boss Steve Kean, in the Brunei Premier League, before Preston North End were confident enough in his fitness to hand him a deal until the end of the 2014–15 season. He managed just a single goal in 13 appearances for PNE, of which all but two were as a substitute, before being released at the end of the season. A month later Ebanks-Blake joined League One Chesterfield on a two-year deal. He scored 11 in 45 for the Spireites across two League One seasons, which included a goalless seven game loan spell at League One rivals Shrewsbury Town. After his release by Chesterfield, he moved into non-league football with a three-month spell at AFC Telford United in 2017-18 before moving to Halesowen Town in July 2018, from where he moved to Barwell three months later.